Anyways, I am thinking of something along the lines of maybe replacing, or renaming, the existing species in the ooniverse. For example "slimy green frogs" is not really something I can picture as an intelligent species, much less those frogs being a space-faring race or civilization. There are some others, but this is the one that comes to my mind, especially after having accepted a contract last night in which I have to taxi such a frog to the other side of Galaxy 1. For such a thing to work, one needs to take some things into account. First of all, how many races are there in the Ooniverse at this time? I would rather that this number remains the same. This would probably make it easier for the development of the game, since it seeds races to the galaxies etc. The Thargoid would obviously remain as they are not inhabitants of systems as such. However there should be distinctions between the races, and I don't just mean how they look, what they are... but also physical differences. While I'm not thinking, or caring about the looks of the planets, I do think of a fair distribution of the species in the universe. Maybe we could consider something along the lines of "replacing" or "updating" the existing species in such a way that they would make sense in a sci-fi universe. We can have quite the variety of races, and take in some of the urban legends crawling around the web. For example we can add the Reticuli, which would be the gray aliens. As a side twist sometimes news bulletin would appear in which the grays are believed to have abducted important people from strategically important stations. Then there can be a reptilian-like race which are mostly involved in pirate activities. There can be a trader race, people who excel in science... you know where I'm getting. Additionally, maybe each of the races gets their fair share of systems (like it is now). As a bonus: each race has a different design for their stations. I know this would be a pretty huge task... if at all feasible. I'm just speaking my mind. Re: Repopulation of the Ooniverse? For example "slimy green frogs" is not really something I can picture as an intelligent species, much less those frogs being a space-faring race or civilization. You do realise, don't you, that somewhere out there a moist, green amphibian philosopher is really struggling to get his head around the concept that a dry mammal species (and a nearly hairless one at that) could ever evolve intellectually to the point of actually developing technology, let alone rocket science. Amphibioids are usually a lot sharper than their wet, sluggish appearance would suggest. They are usually keen to trade in narcotics, or exotic foodstuffs. Skin creams are always well received. Technologically they tend to be backward, but will pay high prices for such middle-range items as automated ponds, croak metres, spawn freezers and swamp purifiers. First of all, how many races are there in the Ooniverse at this time? There are eight types of critter. Of course, there's an as-yet-uncounted (as far as I know) number of species. Me, personally, I think that the Green Horned Humanoids from Tiinlebi are a completely different species from the Blue Furry Humanoids of Edreor. It looks like only humans have extensive colonies, for some reason - although it's possible that e.g. the Green Fat Insects of Tioranin are the same species as the Green Fat Insects of Arazaes: both are Democracies, both are TL7, and the two worlds aren't even hugely far apart, both lying in the north-east quadrant of Galaxy 1. But if they are the same species, are they native to Tioranin or to Arazaes? Or from somewhere else? Humanity's homeworld isn't anywhere on the map, after all. Is there a connection to the civil war on Tioranin? There's no right or wrong answer to any of this, of course - it's all just randomly generated. Personally, my imagined universe contains a lot of different species, each made up of many different cultures - but that's just me. 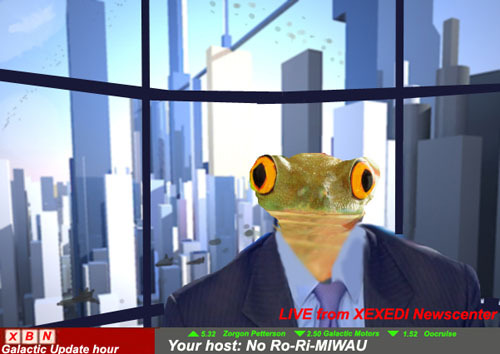 <chortles> Are the Large Yellow Bug-Eyed Frogs of Xeer related to the Large Yellow Bug-Eyed Frogs of Xeer? Personally, I rather like the species groups as they are. Whilst there's excellent oxp potential here (planetinfo.plist IIRC, 'find and replace' a few times and you're away), I think the familiar animal-based species have a certain charm. And if you find slimy, green frogs hard to imagine then perhaps it fits well with some of the game's humour: edible arts graduates; love of food blenders etc. Besides, forms that have already developed (even if not particularly far from an intellectual point of view) are perhaps more realistic than entirely imagined ones - unless you really have witnessed Greys etc. in which case I have little to add. Cody wrote: <chortles> Are the Large Yellow Bug-Eyed Frogs of Xeer related to the Large Yellow Bug-Eyed Frogs of Xeer? Galaxies apart! But surely related … the Galaxy 1 Xeerlings ("very well known for [their] fabulous cuisine") are TL8, though, while the inhabitants of Xeer in Galaxy 7 ("a revolting little planet") are only TL4. Which is the original, and which the colony? I've heard that archaeology is under strict government control in Xeer (G1) … are they hiding something? I've heard that archaeology is under strict government control in Xeer (G1) … are they hiding something? Gotta be! My money's on the Seventh's Xeer being the original. As an aside, Povray's Xeers are not dissimilar. Which is the original, and which the colony? I've always thought (felt?) that all species (Rodents, Frogs, Lizards, Lobsters, Birds, Humanoids, Felines, Insects) are descendants of Earthling ancestors, and are not considered 'Aliens'. Given that there are 8 non-human inhabitants groups and 8 galaxies/sectors, a nice way to make the galaxy maps feel a little more unique might be for each one to contain a single alien group. It could even progress in terms of an evolutionary 'tree', with the 8 sectors being as far as human colonials have been able to travel thus far. Greater distance could then be true both in terms of travel and genetics. Human Colonials are far more common than the others, so there could be the idea of humans occupying uninhabited worlds (or conquering inhabited ones) in 'alien' space. That might be a more interesting way to reimagine the more varied galaxies idea I have mentioned previously. I've met this guy at Xexedi main station. but I wouldn't go as far as to call him 'intelligent'. Also, does not handle liquor well. Any species that builds skyscrapers and wears suits and ties isn't all that intelligent..
For me, it would break the immersion. Species evolve together. That they would have evolved in separate galaxies and yet are so similar is a deal-breaker for me. I quite like the explanation from the novel. It solves the game mystery.